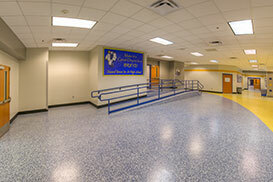 Council Grove High School was looking for a flooring solution that would extensively promote their school spirit while providing an amazing look and design. However, due to problematic high moisture vapor transmission within the concrete, finding a flooring system for the 2007 foyer addition that would allow for both a striking appearance and the mitigation of moisture, would prove to be a challenge. Nonetheless, with its unlimited moisture vapor transmission limit, Tennant’s Eco-Crete™ SF was the perfect solution and was applied prior to the elaborate decorative system. Creating a beautiful, multi-colored, multi-logo, decorative flake floor required high attention to detail and a lot of patience. 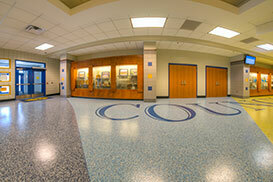 Four different flake blends, coordinating with Council Grove’s school colors, were used throughout the intricate floor design, which included two detailed logos. 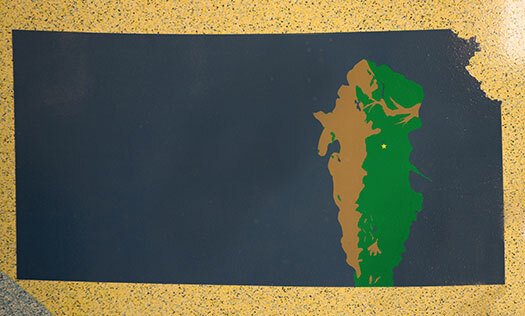 The first logo reflects their school mascot, the Braves, while the second outlines the state of Kansas and highlights Konza Prairie for a sense of community pride. First the cementitious urethane, Eco-Crete™ SF, is applied over the concrete substrate due to high moisture content. Eco-MPE™ is then applied and the decorative flake is broadcast directly into it. 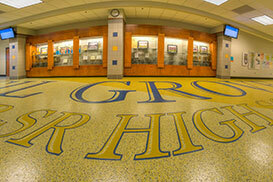 A grout coat of Eco-URE™ (UV-Resistant Epoxy), is applied over the flake broadcast to help reduce yellowing over time. The system is then topcoated with a satin finish using Eco-HTS™ 100 for its high durability and added texture, helping reduce the occurrence of slip and fall incidents. This proves particularly important as the area receives heavy foot traffic near outdoor elements such as dirt, mud, snow and rain which are frequently tracked indoors. 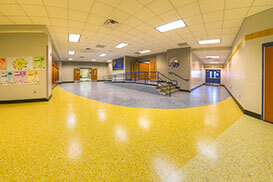 Coatings solutions for education facilities.